I'm normally not a fan of scented hand creams -- or scented lotions of any kind, really. I just don't like cloying scents, which I feel like most lotions contain. 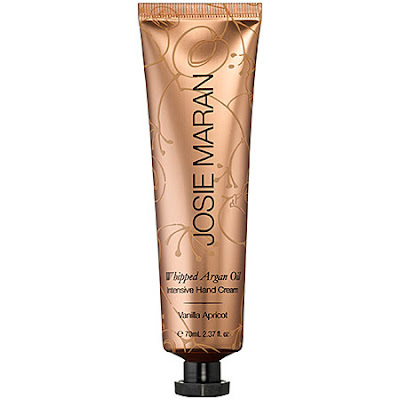 Not the case, however, with Josie Maran Whipped Argan Oil Intensive Hand Cream. For starters, I really love the packaging. The hand cream comes in a gorgeous copper tube decorated with a swirling floral pattern -- so elegant and beautiful. But it's what comes out of the tube that's really wonderful. The formula is whipped, lush and creamy. It sinks into skin immediately upon contact, leaving them feeling buttery soft. And it's delicately scented with vanilla and apricot -- not too much to be cloying or overwhelming, but just enough to put a smile on your face. In short? Your hands are about to be whipped into shape. Josie Maran Whipped Argan Oil Intensive Hand Cream retails for $22 at sephora.com. I really love hand creams. I have been using hand cream for almost a year now. I would love to try this product. Thank you very much for sharing.